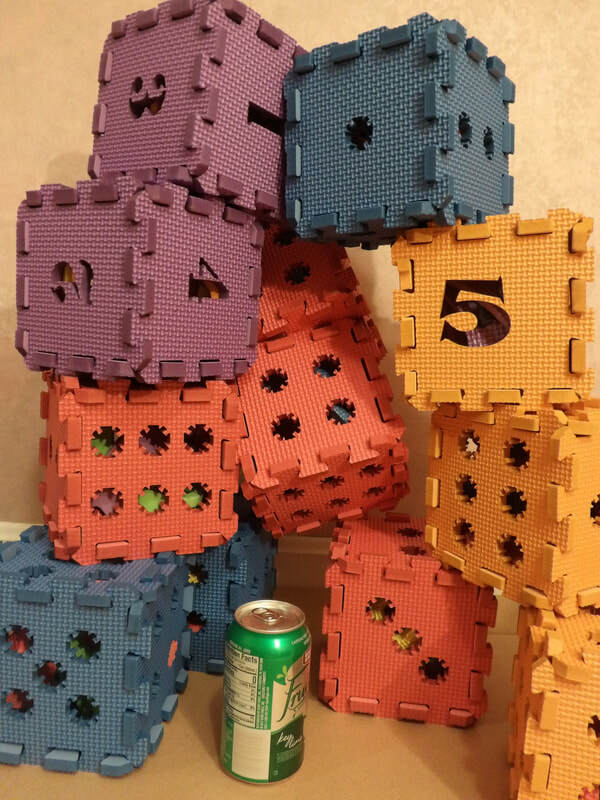 These GIANT DICE were created while we making a jumbo version of Obelisk for the Cleveland Mini Maker Faire! Buy some EVA foam sheets! You can either get these from a big box store or ask if your friendly local laser cutter has a sheet you can buy. 6 colored Sheets = $20 from HD, Amazon. Each sheet will make 2 dice so this could potentially be twelve 6x6x6" dice! Go to your local library or maker space which has a laser cutter that is free to use to the public. Here in Cleveland we have the Cleveland Public Library, Cuyahoga Public Library, and Think[Box]. Choose the plans from the right that work best with your laser cutter and download those plans. If the sheet of material is too large for the laser cutter, you may need to cut the sheet with a knife before putting it into the laser engraver. Ask your friendly library or maker space operator to help you align, and focus the laser cutter.